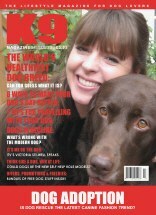 Victoria Stilwell is one of the most well known and well respected professional dog trainers in the UK. Her firm, no nonsense and natural approach to dog training on the popular Channel 4 show It’s me or the dog helped many owners of misbehaving dogs sort out their problems. In turn many viewers of the show learned simple and common sense methods of managing unruly canine behaviour. Victoria now lives in America where she volunteers her time to help dogs in various needy situations. She took time out of her busy schedule to talk to K9 Magazine. Tell us about your dog owning history. I always wanted a dog when I was younger but my father and mother both worked long hours so having a dog was not an option. My grandmother bred beagles and was passionate about the breed. I spent a lot of time with her while growing up and she taught me the basics of responsible ownership. What drew you to making your love and passion for dogs a professional thing? I got into dog training inadvertently. I was an actor trying to make a living. Acting work is hard to get and you are always advised to have a second job so I started to walk dogs. I was soon walking twenty dogs a day and loved what I did. I met a number of behaviourists who influenced my desire to learn more about the dogs I was walking and it just grew from there. You’re now living in Georgia, how does being a dog owner there differ from the typical experience of being a dog owner in England? Americans are as passionate about their dogs as are the British. In rural areas of Georgia however dogs are generally not viewed as companion animals. They are kept outside in kennels and tethered or allowed to roam around and there is little understanding for their basic emotional needs. Most of these dogs are owned to protect the house or as hunting dogs. What is your favourite memory from your days on “It’s me or the dog”? There are so many good memories and it was a pleasure to be involved. The production team were fantastic with the dogs and the families and the relationships we built with each family were very strong. I don’t think there is any one memory that sticks out but the way we changed dogs’ and people’s lives for the better made the job a really gratifying one. An average day in the life of Victoria Stilwell would entail…..
An average filming day starts early and finishes late. Everything is filmed as it happens. Training days are better because having seen the problem behaviour I can get down to doing what I do best, which is setting the dogs and owners back on the right path. It takes a lot of work so training days are tiring but every effort is made to make it as fun for the dogs as possible. Before I start the training I spend many hours the night before working out the best methods to achieve the desired results. Every dog is unique and therefore every behaviour plan is designed so that each particular dog gets the best out of it. When I leave it is up to the owners to continue the training. Did your dog ever get to come to work with you? None of my foster dogs came to work with me because most of my training was in private homes. Due to your jet-setting lifestyle, you’ve been unable to commit to full time dog ownership recently, but have been opening your home to foster dogs. How does it compare to owning your own dog? Being a foster mum is a rewarding but heartbreaking experience because it is so easy to get attached to the dogs that we look after. Some stay for a few days before going to a new home and some stay a lot longer and even though you try hard not to become too attached, the moment they walk out of the door for the last time is always a difficult one. You’ve also been busy volunteering as a fundraiser and behaviour advisor at some local shelters. How has that been going?